Retailers have found an interesting characteristic of consumers who browse their websites using tablets: They're much more likely to pull the trigger on purchases than other online shoppers. Tablet users are more likely to buy than other online shoppers, and they tend to place bigger orders, Dana Mattioli reports on digits. Photo: Getty Images. A bevy of new and upgraded tablets and e-readers are on the market. See how the base models for the different devices stack up, including Amazon's new Kindle Fire tablet. That discovery is making retailers focus on tablets ahead of the all-important holiday season, as the tough economic backdrop puts a premium on what the industry calls "conversion"—making sure the shoppers who show up actually buy something. Tablets still account for only a small percentage of overall e-commerce, but they are punching above their weight. While the conversion rate—orders divided by total visits—is 3% for shoppers using a traditional PC, it is 4% or 5% for shoppers using tablets, says Sucharita Mulpuru, an analyst at Forrester Research. Many retailers also report that tablet users place bigger orders—in some cases adding 10% to 20% more to the tab—on average than shoppers using PCs or smartphones. Retailers are trying to take advantage of that trend by tweaking their websites to better accommodate tablets and rolling out catalogs that have been developed for the device. "Everything helps," says Peter Sachse, chief marketing officer at Macy's Inc. and chairman of Macys.com. The tablet market is still dominated by Apple Inc.'s iPad. 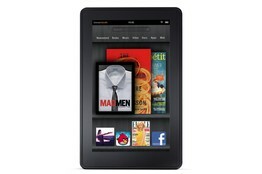 Offerings from new entrants including Amazon.com Inc., which is expected to unveil a tablet Wednesday, could further broaden the market. 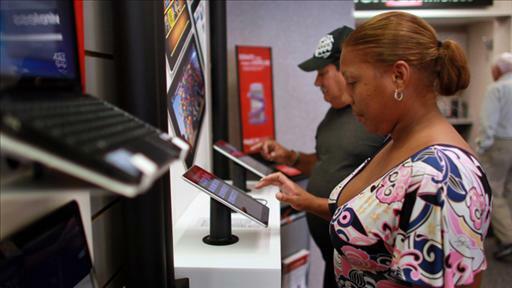 Forrester Research thinks one-third of U.S. adults could own tablets by 2015. For most retailers, e-commerce is the fastest growing part of their businesses, posting double-digit revenue gains each year even as in-store growth remains muted. Around 3% of the nearly $150 billion U.S. consumers spent online last year came via mobile devices, of which tablets are a rapidly growing component, according to market research firm comScore Inc.
Members of the media examined Sony's new Android-based tablet computers. Tablets account for a small percentage of overall e-commerce, but they are punching above their weight. While only 9% of online shoppers own tablets, their behavior is encouraging for retailers. Consumers tend to spend more time on the Web after buying a tablet, and nearly half shop from the device, according to a survey of more than 2,300 consumers by Forrester. Tablet owners tend to be wealthier, which gives retailers a self-selected audience of their best customers. They may also be encouraged to spend by less tangible attributes: large touchscreens that draw users into the content, and a portability that helps users get more comfortable than when surfing on PCs. Macy's, teen retailer Abercrombie & Fitch Co. and Gap Inc. all say they are seeing the highest percentage of conversions from shoppers using tablets. The companies wouldn't disclose figures. Blake McCrossin, a public-relations associate in New York, says he thought shopping would be the last thing he would do on his iPad. The 30-year-old has since used the Apple device to order everything from clothes to a flat-screen television and has already finished most of his Christmas shopping using it. "The visuals and graphics are amazing, and I get caught up in impulse buying," Mr. McCrossin says. Shopping network QVC promotes tablet use on-air and through its social media channels. It is also using alternative technologies to Flash on its website to accommodate the iPad, which doesn't support that software. "We see it as a key growth vehicle for QVC," says Claire Watts, CEO of QVC U.S. Mobile commerce accounts for about 3% of QVC's revenue, which last year came to $7.8 billion. Tablets are the fastest growing part of mobile and deliver a higher conversion rate than mobile or PC users, according to Ms. Watts. Macy's, which owns its namesake department store as well as Bloomingdale's, began making its sites compatible with devices that don't support Flash this year. The department store owner is rethinking the "point and click" experience of its website, which like most others was designed on the premise that links would be clicked with an arrow controlled by a mouse rather than by a user's finger, which is more blunt. "Every website in the world was built for a mouse," says Mr. Sachse. "We underline things to click. We are thinking about what that should look like in a touch environment." Many retailers are finding tablet users prefer to visit their main websites directly through a browser, just as they would from a PC, even though some companies have pumped lots of money into creating specialized sites that would work better with mobile phones' small screens and long load times. Cosmetics chain Sephora uses the same website for tablets as it does for PCs, says Bridget Dolan, Sephora's vice president of interactive media. Sephora also has a free tablet app. QVC also says more tablet users visit directly through its website than via its apps. Some retailers are revamping their catalogs in light of tablets, which allow them to add videos, slideshows, how-to demonstrations and 'order' buttons. Sephora dropped its summer catalog for the first time this year and shifted entirely over to tablets in an experiment to see what effect it would have on sales. The company will continue to produce print versions of its other seasonal catalogs. Sephora has partnered with Google Inc. and online shopping site TheFind, both of which have tablet apps that aggregate catalogs from brands such as Nordstrom Inc., Crate & Barrel, Neiman Marcus and Urban Outfitters Inc. Users can swipe through their favorite catalogs and place orders through the free apps. Siva Kumar, CEO of TheFind, says the conversion rate on its Catalogue app is about 10% higher than on its website, and average order size is between 10% and 20% higher. Tablet users on average are spending three times as much time on the catalog app than on the website, he says.Sephora receives as much revenue from tablets as it does through mobile, even though people visit Sephora by smartphone much more often. Sephora's tablet conversion rate and average order size is also higher than PC and mobile, says Ms. Dolan. "She who can afford a tablet tends to be a higher spender in general," she says.